Big scientific advancements sometimes come in small packages. 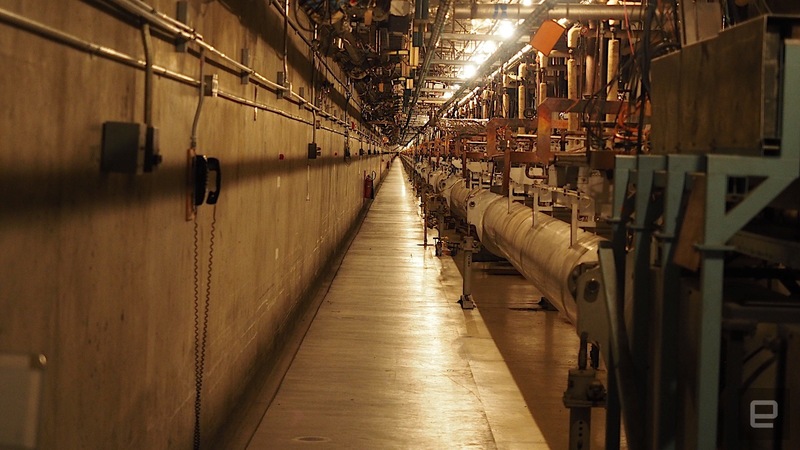 When the SLAC National Accelerator Laboratory at Stanford first opened its doors in 1966, it had already earned the distinction of housing the world's longest linear accelerator: A 3.2 kilometer monstrosity buried 25 feet under the gently rolling hills of Northern California. Today the lab, along with an international consortium of research organizations, is working to create a new kind of accelerator -- one small enough to fit in a shoebox but offering huge scientific potential. SLAC's full-size accelerator, dubbed the LINAC, relies on klystrons -- specialized vacuum tubes that act as radio frequency amplifiers -- to generate high-energy electron beams used in the facility's experiments. They also generate a whole bunch of radiation, which is why the beam is buried in a concrete bunker two stories underground. Electrons are generated at one end of the line and then accelerated to 99.99999 percent of the speed of light, as they travel down the 2-mile long instrument. They are also infused with up to 15 GeV of additional energy. When these subatomic particles smack into their targets -- in this case, either sample material or the electron's bizarro twin, the positron -- they really pack a wallop. The problems with this setup is cost and availability; there are only a handful on the planet, because they're so insanely expensive to build, maintain and operate. As such, the demand for the machines dramatically overshadows the amount of time that the facility can operate. Today, the linac operates on average 24 hours a day, five days a week, with the off days dedicated to maintenance. SLAC's services are in such high demand that only one in six experiments are accepted and those that do get the nod are then expected to adhere to a brutally strict schedule. What if, instead of relying on just a few mammoth linear accelerators around the planet, the scientific community could shrink these devices to the size of a football field? That would enable them to be installed in the basements of most universities and research hospitals, exponentially increasing their availability. Well, in 2015 -- and thanks to a $13.5 million grant from the Gordon and Betty Moore Foundation -- Stanford and SLAC began work on shrinking a particle accelerator from a scale of miles to meters. They call it the "accelerator on a chip" (ACHIP) project. "Can we do for particle accelerators what the microchip industry did for computers?" SLAC physicist Joel England, an investigator with the 5-year project, said in a 2013 statement when the program launched. "Making them much smaller and cheaper would democratize accelerators, potentially making them available to millions of people. We can't even imagine the creative applications they would find for this technology." This device would work in the same manner as the linac but instead of shooting electrons down a copper vacuum tube and pushing them along with microwaves, the AoaC will shove electrons through a precisely-engineered silica chip, smaller than a grain of rice, and excite them with laser beams. It's a two step process. First, the electrons are boosted to nearly the speed of light using a conventional accelerator. They are then blasted through a half-micron tall channel etched into the half millimeter-long silica chip. This channel, as you can see in the video above, has a series of ridges and troughs carved into it. By varying the width of these ridges with respect to the wavelength of the laser, researchers can generate a net energy gain as the electrons pass through. Without those ridges, as soon as the electrons hit the channel, they'd simply wiggle back and forth, riding the undulations of the laser like boats on a wave. The chip's acceleration gradient, which measures the amount of energy added to the electron as it travels a specific distance, is a whopping 700 megavolts per meter (MeV/m) -- that's ten times what the linac can generate. So great, we can make electrons go super fast and pump more energy into them than a toddler hopped up on a 2-liter of Mountain Dew, big whoop? Well, outside of the fundamental physics research that can be accomplished (including their use as X-ray generators for the materials, biology, chemistry fields) the medical applications are numerous. "One of the dreams is to make molecular movies, or something where you capture the state of a molecule at different times in its evolution and do that in a very short time scale," Joel England, SLAC's lead researcher for this program, told the IEEE. "So you can actually see how molecules change as they react or combine with other molecules." Or, take pediatric cancer for example. 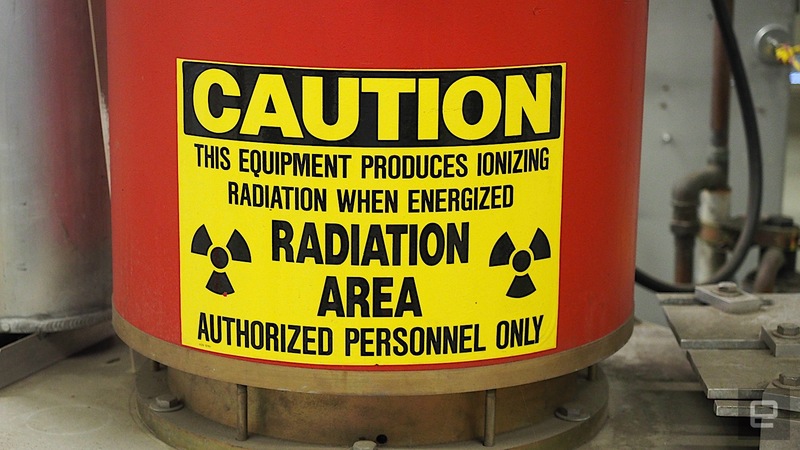 If an adult has cancer and is prescribed radiation therapy, they will have to spend up to 30 minutes a day, multiple days a week, for weeks on end lying on a table while industrial medical equipment blasts them with high energy particles. The process is even worse for kids, who must be anesthetized each session. With a miniaturized particle accelerator on the other hand, we'd be able to replace that 10,000-pound, multimillion dollar radiotherapy machine with an inexpensive device (paired with a simple fiber laser power source) that can burn out tumors faster and without the need for anesthesia. "Once you get into a million electron volts or more then you're sort of in the regime of where you can have practical applications; where something like a medical accelerator is more viable," England told IEEE earlier this year. "So typically for cancer treatment you're using particles with between one and 20 million electron volts of energy." And by making them portable, doctors can bring this life-saving technology to more people in even the most remote locations. "We still have a number of challenges before this technology becomes practical for real-world use, but eventually it would substantially reduce the size and cost of future high-energy particle colliders for exploring the world of fundamental particles and forces," he explained in 2013. And even when that does happen, there likely won't be a day when you can just pop down to the local electronics store and pick up an accelerator of your own. The amount of radiation generated by a tabletop accelerator might not match that of the linac, but it is still enough to cause significant harm. "I don't think it's becoming a household appliance," England quipped.